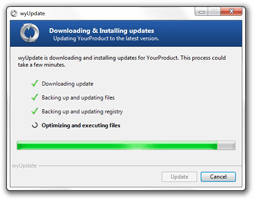 wyUpdate is the standalone updater that's created with wyBuild. It's written in C# and has been thoroughly tested on Windows 2000 through Windows 7. 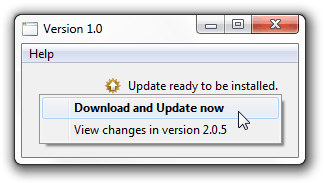 The AutomaticUpdater control can be used with any .NET app as a way to fully automate the update process. Windows 7 Progress Bar is an open source progress bar component that allows you to add a progress bar to your program's taskbar button. Plus, you can control the different states of the progress bar (normal, error, and paused) for Vista & Windows 7. Lastly, the Windows 7 Progress Bar is backward compatible so you can use it with Windows 98 onward. VistaMenu is a menu component that allows you to add Windows 7 and Windows Vista-style menus with icons to your program. It's written in C# and works with all .NET languages. SplitButton is a button control with a region that shows a context menu when clicked. It's written in C# and works with all .NET languages. LinkLabel2 is a fixed version of the Windows.Forms LinkLabel control. It features the correct system "hand" cursor, and correct font rendering. Below are projects that are no longer maintained, but we'll freely accept bug fixes. CueSharp is an open source cue sheet parser library written in C#.